How To create gorgeous Royal Purple wedding flowers for all Brides. When my daughter chose her wedding colors, she decided on Royal Purple for her flowers. The best type of flowers that I could come up with were purple petunias. These flowers are very simple to grow. You need to have a few months to go before the wedding, and spot in the sun where you can grow up to 30 plants. If you have a bit of a green thumb this is definitely the way to go, because it can be a very full filing project, and a lot cheaper than getting a florist to do the wedding. 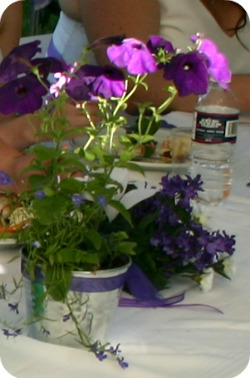 It's quite simple to plant them in small pots and decorate the containers for the reception tables. For my daughter's wedding we planted them in small metal pails and then tied a purple ribbon around the pail for and nice accent. They look stunning on white table cloths. In order to get the petunias ready for the wedding in July, I had to purchase them in early spring, when all of the gardening plants were in season at the plant shops. I found that the plants you get from reputable plant nurseries do best. 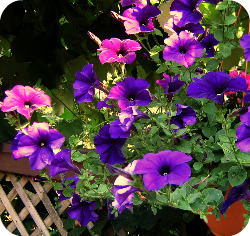 Petunias come in many shades, from pinks to a color I like to call Royal Purple. They are absolutely stunning when planted close together in groups of three or so. I used 4" small aluminum pails form the craft store. I needed 30 of them because we had 25 quest tables and I wanted a few spare to put on the head table. I planted about 3 plants per pail. So I bought several flats of petunias. 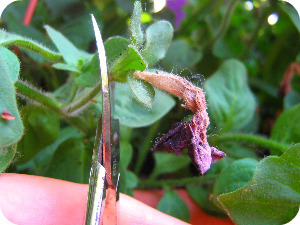 I found that the Royal Purple petunias grew the best when I cut off the dead blooms every third day or so. It stimulates them to produce more blooms. One can also cut the odd out of place branch to achieve a more desired look. As you can see form the demonstration photo, just cut the dead blooms off. Do not just pull the dead blooms off. If one just pulls the dead blooms off, the potential seed pod stays behind. If this happens the plant will use all of it's energy to produce seed and not fresh blooms. For a more prolific plant with lots of blooms, one needs to cut the dead blooms off at their stem. I wish you the best at your endeavors and if you have any questions in regards to this page or any other on this site, please send me a line. I love to hear comments from my visitors.